Hey, there! Would you like a short story from me to help you get through your Monday? Of course you would. 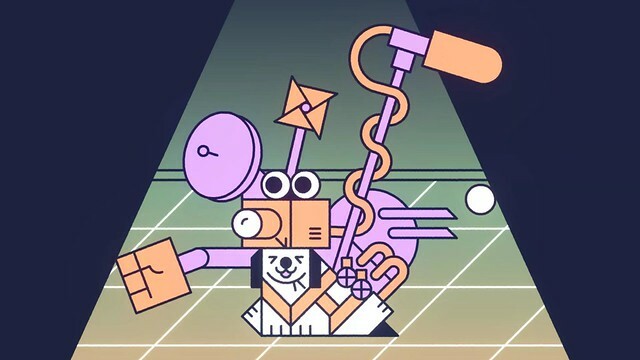 So here it is: “A Model Dog,” which I wrote for The Verge as part of its “Better Worlds” series of optimistic science fiction. In it, two engineers at a very large tech company are tasked with building a robot dog. Why? And for what purpose? That’s in the story, of course. It’s a short piece (under three thousand words), and I think it’s pretty fun. There’s even an animated version, adapted from the story. It’s pretty cute too. When you’re done reading/viewing the story, there’s also an interview with me on the site, talking about pets and tech and privacy and other such things. I may make mention of Smudge, who I know is a favorite around here. Check that out, too. Not an entirely bad way to start the week, I’d say. Very sweet! I liked it. Oof. I had never thought much about how my dog sees me until that “you’re never a better person to anyone than you are to your dog” bit at the end. Grokked that real hard. Too many emotions at work. Definitely a great way to start the week! Love it. I can’t imagine Smudge approves of you writing about the enemy. Though I expect he believes they could use some improving. Fun! It didn’t go where I expected it to go, and I laughed a lot along the way. Also, I enjoyed that neither of the characters were gendered (or named, or anything else), nor was the worker’s cousin, and it didn’t affect the story a jot. Thanks for the tip. It’s in my reading queue. My wife had rotator cuff surgery in December so I’m doing everything, leaving less time for such activities. She gives me verbal instructions on cooking things I’ve never cooked before though, and I’m really enjoying that. What I do not enjoy is walking our miniature schnauzer twice a day. This morning it was 5° when we went out and he doesn’t seem to mind but I was miserable. Don’t get me wrong, I walk him all the time, but now that it’s mandatory and I have to get up early every day for the first outing, it’s like working again. Not cool! John, that one was worthy of Isaac Asimov. Honest. What, Elon Bezos-Zuckerberg the Former CEO didn’t want the Engineer to build him a Best Version of His Dad for himself? That’s what I expected the punchline to be – except of course the Engineer doesn’t have several years of biometric data on Dad interacting with him. You don’t write as much humor as you used to – I miss it, and had a lot of fun reading this story. I’m not sure I write less humor in fiction — I wrote three short stories last year, all of which were humorous, and then there’s this one. I do think I’m less generally funny than I have been in terms of posts here. I wholeheartedly agree with GreggB. Very Asimovian. But was android dad programmed with the Three Laws? So is this an origin story for the emperox’s neural network? Alan notes that there was not names or genders. Oh. I hadn’t noticed. Huh. I would put a context: the stage and page require things to be in the eye of the consumer. Not like Hollywood. Back when sci-fi movie reviews always mentioned the special effects near the lead sentence, Asimov said that for printed sf we still have special effects, but in our minds. Well, I heard that conversation in my head in the voices of ex co-workers, so they were plumb full of gender when I read it! My most best pup passed a few months ago, and, not gonna lie, if this tech was an option, I totally would have paid a generous sum of money for it. Started reading it but couldnt get Wil Wheatons voice right in my head. Would be great if he could narrate this. That was a great story; thank you. Also enjoyed the video and the interview. I agree with your idea that we get something from having different pets that we wouldn’t get if the one pet was immortal. At the moment we have four ferrets while I often wish we only had two, or even one. But when I try to think which ones to wish we didn’t have, well, that cannot be done. Thank you, I really enjoyed that, stories that leave me grinning are few and far between, but much needed. You made my day; thank you! Every security and privacy concern I battled as an information secutity officer came back in memories of frustration in trying to curb. I smile that I don’t have to deal with the issues because I am retired. c’est la raison! So in the story it’s a new dog, in the video it’s a 30-years old dog, why they’re different?